William was educated at St. Cuthberts College, Worksop, he entered Sheffield University in 1908, at the age of 17. He graduated with an honours degree after having obtained the Kaye Scholarship for the highest marks in Anatomy and Physiology. William joined the Royal Hospital as an assistant house physician just prior to enlisting in the 3rd West Riding Field Ambulance in the Territorial Force, he gained a commission on the 8th August 1914, with the rank of Lieutenant, and went to France immediately. William was promoted to Captain on the 1st December 1918 and served as acting Major from 4th January 1918 - 10th July 1919. 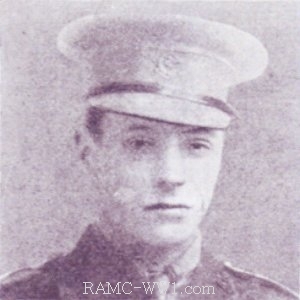 William was awarded the Victoria Cross when serving as Medical Officer attached to the Royal Artillery, the date of bravery was 3rd September 1916. The citation reads "For most conspicuous bravery and devotion to duty. When gun emplacements were unloading high-explosive ammunition from wagons which had just come up, the enemy suddenly began to shell the battery position. The first shell fell on one of the limbers, exploded the ammunition and caused several casualties. Capt. Allen saw the occurrence and at once, with utter disregard of danger, ran straight across the open, under heavy shell fire, commenced to dress the wounded, and undoubtedly by his promptness saved many of them from bleeding to death. He was himself hit four times by pieces of shells, one of which fractured two of his ribs, but he never mentioned this at the time, and cooly went on with his work till the last man was dressed and safely removed. He then went to another battery and tended a wounded officer. It was only when this was done that he returned to his dug-out and reported his own injury." Apart from the fractured ribs, William was also bayoneted - when helping enemy wounded, and was gassed and blinded. After the war he joined the regular R.A.M.C. and served in India where, weakened by his wounds, he caught dysentery and malaria. In 1924 he moved to Chichester as a doctor but in 1932 was involved in a car crash and died the following year. His postmortem revealed that he had been taking a lot of drugs over the years, which it was agreed was taken to relieve his pain. The conclusion was that even though William survived the war by 15 years he was very much a victim as his comrades who had been killed in action and he was given a hero's funeral.